In Equine Assisted Psychotherapy, horses have been shown to be used as tools for military veterans to gain self-understanding and emotional growth. It recognizes the bond between animals and humans and the potential for emotional healing that can occur when a relationship is formed between the two species. In most cases, the horses are not ridden, and usually are not tethered in the arena, but allowed to roam free. Exercises can be as simple as giving the client a halter, and letting them figure out how to approach the horse and put it on. Horses are prey animals, and, like those who have been to war, rely on their heightened senses for survival. They react to and mirror the emotions of visitors directly, without words. Horses respond negatively to negative emotions. They respond positively to positive emotions, and they have no ulterior motives. Horses also possess a variety of "herd dynamics" such as pushing, kicking, biting, squealing, grooming one another and grazing together. In the process of describing the interactions between horses, clients can learn about themselves and their own family dynamics. Jen Hegeman, the creator of the Hegeman Method, and an equine rehabilitation specialist, refers to horses as "1,200 pounds of lie detector." 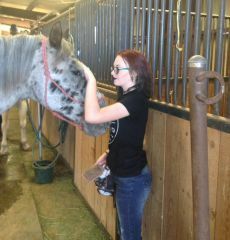 Her role is to interpret the horse's body language, such as flicking ears, wide eyes, or a dropped shoulder that will provide feedback for the therapist and the veteran. At WSR, we have similar specialists who incorporate the reading of the horse along with the reading of the client to offer a unique based modality of treatment.